For the love of life: Justrite Papercraft: Merry Christmas and a HUGE SALE! Justrite Papercraft: Merry Christmas and a HUGE SALE! Hi there, Happy day after Thanksgiving! Hope you had a blessed time spent with your loved ones and had some yummy food. I sure did! I wanted to share with you today a new shaped card I made using a couple of brand new Justrite Papercraft stamp and die sets. Justrite Christmas Mini Tags Clear Stamps, Justrite Snowflake and Tag Dies and Justrite Multi-Step Poinsettia Dies, which accompanies the stamp set with the same name we came out with earlier. I am sure you will love it. What I love about these new goodies, is that you can do so much with them! 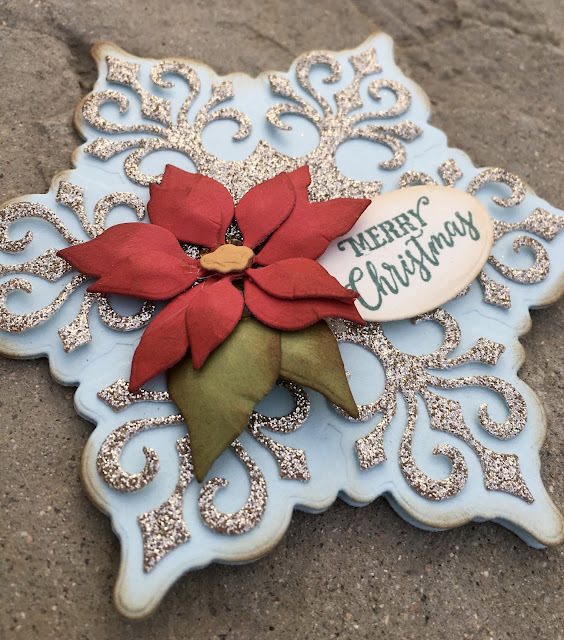 I created a little shaped card, but you can make ornaments using the same look, you can do tags for your christmas gifts, you can make place tags for your christmas dinner, just to give you a few ideas. Anyway, the way I made is that I die cut two of the bases using the Justrite Snowflake and Tag Dies and light blue card stock. Than I die cut the snowflake from the same dies out of gold glitter card stock, and the picture really doesn't do justice to this. Than I die cut the tag from the same die set and stamped my sentiment on it. finally I die cut my flower from the Justrite Multi-Step Poinsettia Dies set using red and green card stock and yellow in the middle. I wanted to show you that you can use these dies even without the stamps. You can try using patterned papers if you like for added affect. For me, I wanted a simpler look, so that's what I did. Well, that is it for today. I will be back with more Justrite creations soon! Have a fabulous time shopping!